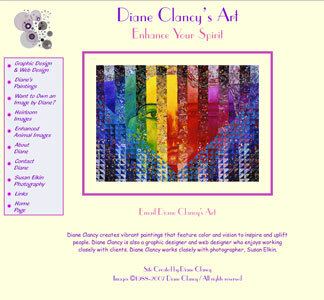 Diane Clancy created this site to showcase her artwork and her graphic design and web design work. She is excited that "Many people tell me they visit the site to feel renewed and uplifted." Diane hopes that you will want to get some or her images and will get her to do design work for you. Diane's specialty is working with you to create your site highlighting your own ideas. Diane Clancy would be delighted to discuss your design needs with you at 413.773.7333.